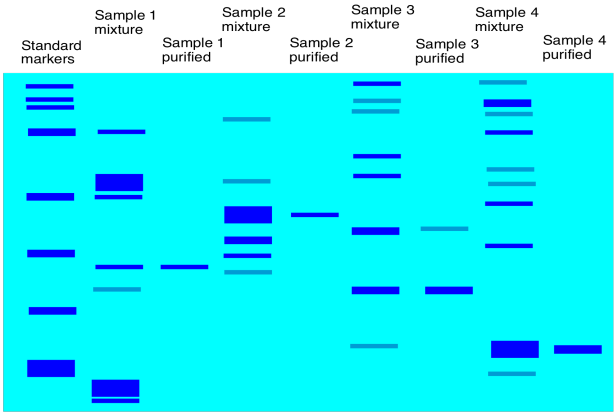 Electrophoresis is a method of separating charged molecules from one another. In order to do so, a voltage is applied across the sample. Positively charges molecules are attracted to the negative electrode and negatively charged molecules are attracted to the positive electrode. Figure PM14.1. The electrical basis of electrophoresis. Typically, this method is applied for the purification or analysis of very large molecules, such as proteins and DNA. These molecules are charged to begin with, so they make good candidates for movement via electric field. DNA is negatively charged because of the phosphate groups along the backbone. Of course the DNA is accompanied by counterions, but in a buffer solution the DNA molecule itself will act as a large anion, and it will move toward the positive electrode. Figure PM14.2. The phosphate group on DNA makes it anionic. Proteins are also charged because they contain charged end groups and side chains. A buffer is chosen to give the protein net negative charge, with more anionic sites than cationic ones. That way, it will also move toward the positive electrode. Figure PM14.3. The effect of buffer on polar side chains in a protein. One practical aspect of electrophoresis is that molecules must move through a stationary gel medium. A gel is composed of a solid matrix swollen with liquid. For example, the medium may be based on agar or, in a common method, a polyacrylamide gel (used in PAGE gel electrophoresis), and it is swollen with a buffer solution. The medium is not designed to bind the molecules, but it does exert drag on macromolecules as they move through it. That's true of a large molecule moving through any surroundings; think of all the water molecules that will have to get pushed out of the way to make room for a huge protein as it migrates through. That drag will slow the progress of the sample through the electric field. 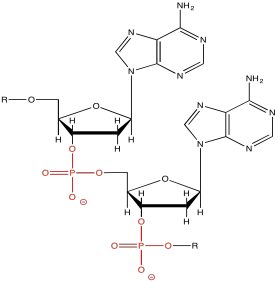 The overall result is that the electric field keeps all of these anions moving in the same direction, but the drag from the medium exerts a slowing effect. The drag is really the key part of separation. The larger the molecule, the greater the drag, and the more slowly the molecule moves. In gel electrophoresis, small molecules move the fastest, and large molecules move the slowest. Setting up electrophoresis is basically similar to chromatography, although a little more complicated. The idea is still like a race between the molecules. We start with all of the molecules at the same starting line and see who is fastest. After a gel is run through electrophoresis, the gel is usually stained with a dye (such as bromothymol blue) so that we can see how far each protein has moved. Usually a gel is calibrated so that you get some idea of how big the proteins are in your mixture. A mixture with known components of known molecular weights is run alongside the sample that you are analysing. By comparing how far proteins in our mixture moved compared to proteins in the standard mixture, we can estimate the molecular weights of proteins in our own mixture. Figure PM14.5. A cartoon showing a developed gel. There may be different steps in electrophoresis that are designed to make things go more smoothly. For example, a protein mixture is complicated by the fact that the proteins have different secondary and tertiary structures; they have different shapes. A compact, spherical protein might move more efficiently through a gel than a more open, floppy one. As a result, a heavier protein may move farther on the gel than a lighter one simply because of its shape. To get around this problem, a surfactant (kind of like soap) may be added to the mixture; the surfactant with help to unwind the proteins so that they are all in open chains. The proteins are denatured now, but they are all more similar to each other, and it is easier to compare them based solely on molecular weight or chain length.